Hearing aids related products including sweatbands, batteries, dehumidifiers, earplugs, and more! The Electronic Hearing Aid Dryer. 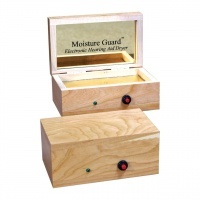 Protect your Hearing Aids from damaging moisture. Premium storage case lets maintains the sound quality of your hearing-aid, removes harmful moisture while you sleep, and prevents costly re-pairs to pennies a day. Size: 5-1/2W x3Hx3-1/2D. Operates with 12v adapter (included). 90-day warranty. 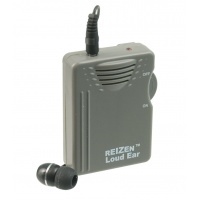 The Reizen Loud Ear 110dB Gain Personal Amplifier for the hearing impaired is a powerful personal amplifier with a built-in microphone for clear and loud delivery of voice and sound through the single mini earphone. This personal amplifier picks up sound at a distance up to 100 feet away. Handy built-in belt clip allows you to attach it to your belt or clothing. Includes 2 AAA batteries and single earphone. Additional earphones are available to use as spares or replacements. Estimated battery life: 48 hrs.